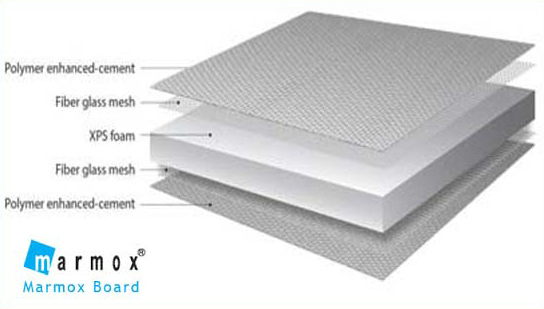 A Florad Water Based Heating System is one of the most environmentally friendly methods of heating your home today. Through the installation of a specifically designed pipe layout of your homes floors, warm water is used to distribute warmth evenly and at your desired temperature to even the furthest corners of your home. Florad is a radiant floor heating system whereby warm water is pumped through polyethylene tubes manufactured to highest European standards, arranged in such a manner as to distribute heat quickly and evenly through the building. Tubes are spaced between 150mm and 300mm to enable lowered input requirements. The heated water is transported in the tubes and conduct heat into the floor slab/screed. The resulting warm floor, radiates heat into the room, heating all solid objects such as furnishings and people in the same manner that the sun heats the earth. Tubes are connected by flow and return lines to a distribution manifold, housed in a panel. The manifold is connected to the circulation pump and heat source. Primarily energy for a Florad floor heating system is derived from the use of a heat pump, cutting your carbon foot print/running costs by up to 66% in comparison to electrical heating systems. Alternative heat sources such as wood/pellet, gas, electric boilers &amp; solar can also be used to heat the water. Individual room thermostats allow for easy and accurate temperature control. A single thermostat control for entire house is possible, but will require a hands-on approach by home owner. The insulation board is installed on top of the concrete slab. 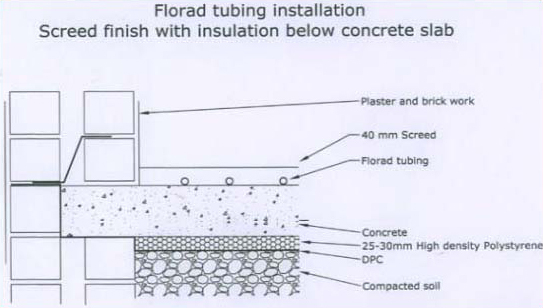 The tubes are attached to the insulation and covered by a ref100 mesh layer for added screed strength. 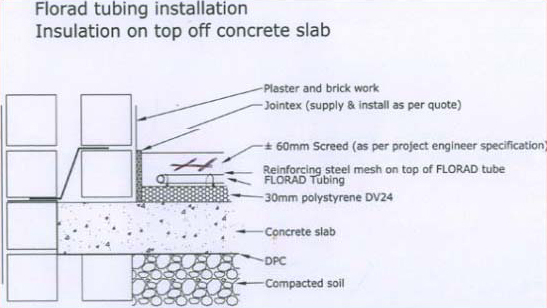 A Screed layer of min 60mm is recommended. This method allows for improved heating response times. The insulation board is installed before the concrete slab is cast, creating a barrier between the concrete and the soil layer below. This method promotes heating stability by creating a larger heat sinc.